Written and illustrated by Ethan Long. 40 pp. G.P. Putnam’s Sons. $15.99. Doubling as a baby book and an early reader, this book about the ups and downs of avian rivalry succeeds abundantly on both fronts. Three linked stories feature three birds trying to outdo the others in one way or another. Who is tallest? Who flies highest? Is it better to be up or down? With clever humor, the simple text conveys lessons about adjectives, opposites and early math concepts. Long’s brightly colored exotic birds look like a cross between Mo Willems’s pigeon and Nickelodeon cartoons — animated, expressive and entertaining. A judicious sprinkling of oversize flaps provides an interactive element that expands — literally — on the proceedings. 18 pp. Handprint Books/Chronicle Books. $12.99. 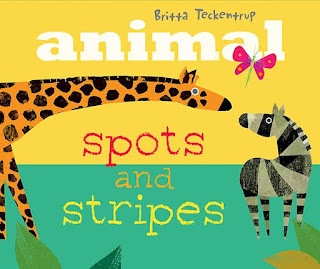 Each of these beautifully produced interactive picture books contains toddler-friendly die-cut flaps that enable hands-on discovery without the risk of excessive rips or tears. In “Animal 123,” number-shaped flaps on each page open to show an additional animal: one wriggly snake becomes two wriggly snakes; two marching elephants become three marching elephants when a baby elephant is revealed holding his mother’s tail from behind; and so on. Similarly, “Animal Spots and Stripes” teaches young children pattern-recognition skills as it highlights the differences between striped caterpillars and spotted butterflies, striped zebras and spotted giraffes, and other contrasting pairs. Teckentrup, a German author and illustrator, uses bold visuals and playful arrangements that make uncovering each flap’s hidden contents a worthwhile discovery. Both books include a double-flap final spread to deliver a surprise ending. Written and illustrated by David A. Carter. 16 pp. Little Simon/Simon & Schuster. $12.99. Carter’s latest board book features his trademark bug-eyed critters as they go from architectural plan to finished home over the course of a week. On Monday, “the Planner Bugs begin with a good idea” as an “Engineer Bug” and an “Architect Bug” pore over drawings, cleverly rendered as a small flip-book-within-a-book. The bugs naturally build a home out of sticks and leaves, with Roofer Bugs working together to cover every space in protective green, and Carpenter Bugs busy in the workshop sawing twigs with oversize serrated proboscises. Determined 2-year-olds will joyously rip apart Carter’s careful compositions within minutes, but for older children, the book gives a captivating presentation of the steps involved in constructing a home — even if they could crush this particular construction with their bare feet. 16 pp. Little, Brown & Company. $17.99. Woody Guthrie is enjoying a bit of a renaissance among the preschool set, thanks in no small part to Elizabeth Mitchell’s softly beautiful cover recordings. 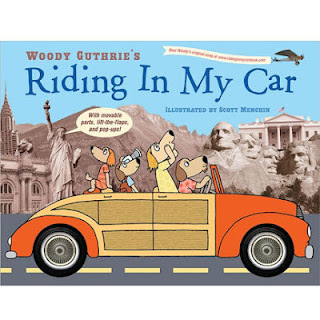 Children primed by car- and kindergarten sing-alongs will especially enjoy this pop-up rendition of the song, which features its lyrics as text. 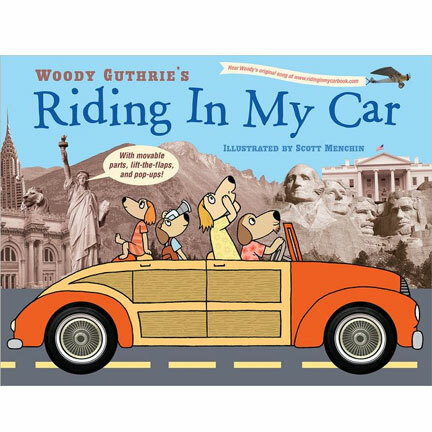 The story, such as there is, follows a cartoonish dog family as it travels from New York to San Francisco, with photographs of American landscape and landmarks as backdrop. (Snippets from “This Land Is Your Land” appear periodically in the background, first sung by the Statue of Liberty). With pull-tabs, flaps, spinning wheels and other interactive gee-gaws, children have plenty to play with as parents warble along. An Internet link on the back cover points to a recording by Guthrie himself; children of tone-deaf parents will wish that a packaged CD were included instead. Written and illustrated by Annelore Parot. 48 pp. Chronicle Books. $15.99. Is there anything more kawaii (“supercute”) than a pair of kimono-clad Kokeshi dolls from Japan? Certainly young girls won’t think so after peeping through the die-cut windows of these smart, clever and irresistibly precious (in a good way) interactive books. In each book — both feature lightly padded and stitch appliquéd covers — the dolls tell their respective “stories,” complete with a smattering of Japanese words. Yumi dresses up and goes to a party with her friends, and Aoki travels to Tokyo by fast train. But narrative and foreign phrases are beside the point. These are books that glorify Japanese design and girly culture — and do it exceedingly well. Annelore Parot, a French illustrator, peppers her interpretation of Japanese design with aesthetic references to Hello Kitty, Kogepan, Hiyao Miyazaki and bubblegum pop manga. The text, in a way that feels like English via French via Japanese, seems purposefully stilted, and this compounds the books’ charm. “Aoki,” with its splendiferous pink celebration of Sakura Matsuri, the cherry blossom festival, is cuter by a hair. But a pair of little girls would be best equipped to arrive at a definitive verdict. 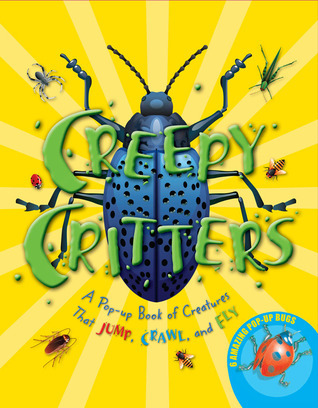 A Pop-Up Book of Creatures That Jump, Crawl, and Fly. 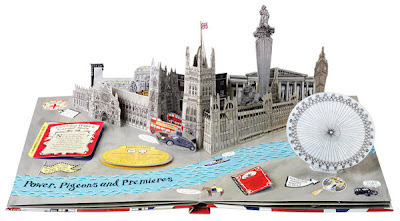 Paper engineering by Richard Hawke. Rather than jamming in every six-legged creature under the microscope, this oversize pop-up offers an in-depth look at six bugs that could safely be labeled Most Likely to Be Encountered in a Child’s Lifetime. A ladybug, a bee, a grasshopper, a spider, a beetle and — all too realistically — a cockroach each get the full-spread treatment, with pop-up portraits that may elicit very different reactions in adult and child. In keeping with the book’s tight focus, the text on the page is admirably restrained, making it highly readable for younger entomologists. A surprising “Did You Know?” factoid on each page may catch parents off guard. Did you know that grasshopper blood does not contain any oxygen, and therefore appears green? That a cockroach can live without its head for several weeks because its brain is spread throughout its body? Sometimes, you’re better off not knowing. This oversize interactive book, made of sturdy cardboard with multiple lift-the-flaps, takes an interesting approach to the same old supersize lizards. Instead of the usual lumping together by behavior, looks or era, Brooks organizes them geographically, showing them as they populated their natural habitats. An introductory spread scatters the creatures across a world map, making it clear the T. Rex belonged to the American West, while Australia had to settle for Muttaburrasaurus and the Wintonopus. (This last looks especially third-tier, and the flap-text seems to back up the impression: “Some dinosaurs are named only from their footprints.”) The pages that follow are arranged by continent and mostly depict dinosaurs of the region during a particular era: in Asia, we see the small, speedy velociraptors of the Cretaceous period; North America features the Late Cretaceous Triceratops and Troodon (a big-eyed night hunter and apparently one of the smartest dinosaurs of the lot). Two final spreads showcase dinosaurs of the air and sea. Written and illustrated by Jennie Maizels. Paper engineering by Richard Ferguson. Just in time for the Olympics, this full-blast bells-and-whistles book teems with graphic pop, if also somewhat haphazard organization (art, religion and literature are lumped together on one spread, for example). But the author knows well what children really care about. Dynamically arranged text, which appears under flaps, within attached mini-books or artfully spread on the page, offers a curated guide to the city: Human hair is used on the wax models at Madame Tussauds. Children can have a birthday party inside a private capsule on the London Eye. And a pair of Queen Victoria’s underpants is on display at the V.&A. An intricate paper model of Tower Bridge spans the final spread, which also features the Olympic Park. What the book lacks in comprehensiveness or even comprehensibility, it more than makes up for in visual panache. Isn’t London famously impossible to navigate anyway? 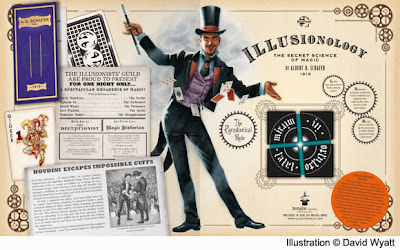 ILLUSIONOLOGYThe Secret Science of Magic. Illustrated by Levi Pinfold and David Wyatt, with Tomislav Tomic. This latest book in the ‘Ology series (previous editions include “Wizardology,” “Monsterology” and “Vampireology,” among others) was reputedly written by a mysteriously deceased magician, Albert D. Schafer. Told through “vintage” graphic ephemera, the text relates that the author, a man of murky origin, disappeared in August 1915. The book is said to have disappeared for almost a century before making its way to the publisher in 2012. Like its predecessors, “Illusionology” includes a visually dense array of interactive elements: flaps, 3D pop-ups, foldouts, sealed envelopes. Among its revelations: the secrets behind Harry Houdini’s straitjacket escape and needle swallowing tricks, the “science” of levitation and the trickery behind spirit mediums. But watch out: readers also learn dice and card tricks that require no special extrasensory ability. Who are grown-ups to question the “value” of such material?